As an astrologer who loves reading books, I pride myself on my book-reviews. I’ve written a few books myself and have followed reviews of them. I was particularly aware of those reviews, often very positive, for which it was clear that the reviewer never read much of the book. As a result, when I do book reviews, I have pledged to study a book sufficiently to understand the author’s intent and to confront its content directly. I owe its author no less. Finding many of today’s astrology books unoriginal and uninspiring, I also decided I wouldn’t review any books that I didn’t find interesting and challenging. My comeuppance came early this summer in the form of an e-mail Alain Negre, asking if I would like to review his book. The title sounded appealing, I thought I could read through it some weekend afternoon and write a review shortly thereafter. The book arrived, I began to look through it, and summer has now turned into autumn. Alain Negre’s book is a visionary, imaginative, and audacious synthesis of ancient number theory and metaphysics, Jungian psychology, advanced modern cosmology, and the structure of astrology’s zodiac. Astrologers interested in a multi-disciplinary approach to astrology, or interested in ideas for their own sake, will find this book thought-provoking and a valuable resource – but only if you put effort into it. In line with much of the Western philosophical tradition up to the modern era, Negre approaches numbers qualitatively, not from our modern tendency to use numbers for numbering, measuring and quantifying everything. 1, 2, 3, and 4, have their specific characteristics to organize the material world, our psyche, and the astrological zodiac. Many people know how these numbers inform musical intervals and hint at the harmony of the cosmos. According to Negre and much of the Western tradition these four numbers organize the totality of everything, physical and psychical. They also underlie ancient and modern astrology, whether acknowledge or not. Negre’s background is in physics, and his book touches upon its history up to its current understanding of the universe. Many astrologers have ignored modern physics, since its conceptual mathematical approach seems far outside the needs and concerns of our clients and their lives. Additionally, most presentations of contemporary physics are wholly materialistic: life and consciousness are epiphenomena of matter arising accidentally in a universe without purpose. Astrology can flourish alongside any set of doctrines which posit we have a purposeful place in the cosmos, and modern cosmology seems far apart from that assumption. Negre has a surprise in store for us. Just inside the book are three quotations by Carl Jung, whose work, along with that of Wolfgang Pauli, form much of the connective tissue of Negre’s work. The third quote gives the clearest picture of Negre’s approach. 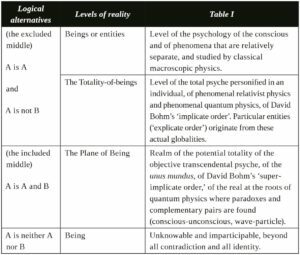 Jung posits an equivalence – and maybe even an identity – of regions of the unknown or inaccessible: the aspects of modern physics beyond the range of the sensible and the regions of the unconscious, the place where archetypes have their origin. Negre asserts that number symbolism brings psyche and the physical world together. Adding modern cosmology to this mix will likely make the author few friends within his scientific community, especially when he uses the numbers 1, 2, 3, and 4, exemplified by the structure of astrology’s zodiac, to present an understanding of the universe. 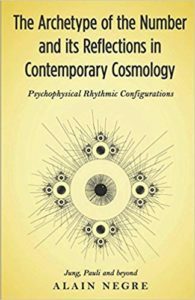 Accordingly, the book’s subtitle is “Psychophysical Rhythmic Configurations”. If you have a notion that Negre takes his astrology from Dane Rudhyar, you’d be correct. Compared to Negre, however, Rudhyar’s applications were somewhat limited. Negre says many interesting things in the first six chapters but the reader may wonder where he’s going with them. He introduces number as an ordering factor of reality – or should I say “realities” – and argues for Pauli’s assertion of the primacy of the qualitative over the quantitative. He discusses Pauli’s idea of “mirror symmetry” linking mind with matter, and his promotion of the imagination – or should I say imaging – for all kinds of understanding, scientific or otherwise. He also discusses the twelve signs of the zodiac as images of universal psychological experiences and archetypes circumambulating the Self. He discusses the limits of scientific knowledge, since the observer – and the archetypes of his or her psyche – is a necessary part of the process of discovery. Because modern physics is based on numbers and mathematics and often deals with the unobservable, one can posit that even this discipline has dimensions we could call metaphysical. Metaphysics, from the perspective of modern science. Based on the work of Michel Cazenave. Click for larger image in another tab. what is observable and testable, usually culminating in God, the One, or Suchness, depending on the tradition involved. Like Ken Wilber, Fritjof Capra and many others Negre asserts that contemporary science creates the space for these possibilities. This gives rise to an interdisciplinary approach to these topics that can also include the foundations of astrology. Using multiple sources, eastern and western, ancient and modern, Negre presents the archetypal symbolism of 1, 2, 3, and 4: one is unity that escapes description and logical understanding, two is the emergence of duality, three reflects to one but preserves duality and so accounts for dynamic flow; four emerges from three as “static wholeness” and completeness. The author brings in Hegel and Schelling in philosophy, Kepler and Fludd in science and metaphysics, the former of each pair leaning toward three-someness, the latter of each pair toward four-someness. He also notes Mary’s inclusion alongside the Christian Trinity, thereby creating something more profound and complete. He looks at the three dimensions of the physical world and adds a fourth to cite the modern concept of “space-time”, or three-dimensional space and “spin”. For those of us who were inspired by Dane Rudhyar’s Galactic Dimension of Astrology and his The Astrology of Transformation, that was small stuff compared with where Negre wishes to take us. Negre brings in modern cosmology within the context of these themes. You know the standard story: the beginning of the universe just after the big bang, expansion and cooling and combining to form elements, the creation of stars and galaxies, the formation of our solar system and planet. If, like me, your understanding of cosmology of 1318 is better than that of 2018, you might consult other sources for standard explanations, and then return to Negre’s descriptions and correlations. Departing from the previous concept of time as a continuous flow, identical everywhere, Negre posits four temporal turning points in the life of the universe. Based on the recent inquiries into emergence that investigate the nature of complex systems, two events are “strongly emergent” and two that are “horizon-type” or “temporal-attracting”. Strongly emergent events flow from the whole to component parts. The first is cosmic inflation and occurred in the early universe as time and space itself were created, and the second occurred a short three-hundred thousand years ago with the emergence of consciousness in our species. At this point you might want to pause and feel a little surprised – we have departed from the materialistic “scientific” universe that we were once schooled upon. We are beginning to enter a realm better articulated by science fiction than by science. Thinking perpendicularly from the two strongly emergent events, the first “horizon event” occurred when the universe was about 380,000 years old, when photons were released from the primal stuff of the early universe, when matter and light decoupled, and the universe could take material form and “fall into gravity”. The second horizon event is wholly outside our standard depiction of time; it is the condition of the beginning and the end of everything, the head and tail of the alchemical ourobos that connect with each other. Here all temporal or special measurements slide into infinities. These four positions yield three quadrants that are temporal and a fourth that is a-temporal. From the perspective of four quadrants, the emergence of consciousness is the exact halfway position in this cycle. Negre finds parallels between these four quadrants: four causes of Aristotle, and four processes of alchemy. Negre builds on the standard teachings on the nature and origin of the universe, making a leap from physics to something approaching metaphysics. Fasten your seatbelts. You know what happens next. These four “events” are also four turnings that manifest in our lives as turning points of spring equinox, summer solstice, autumn equinox, and winter solstice. To arrive at the twelve signs of the zodiac we subdivide four quadrants into three regions that are the cardinal, fixed, and mutable signs. Negre parallels the modes with forces used in contemporary physics and cosmology: gravitational, strong, and electromagnetic. Negre also uses the dialectic of thesis-anthesis-synthesis to structure the four quadrants and show parallels between them. Briefly, the cosmology of first two quadrants takes us from the beginning of the universe to the present time. At the beginning of the Third Quadrant is the emergence of reflective consciousness which is the leap of the universe becoming conscious of itself. Here’s another surprise. This process, represented by the Third Quadrant, has three parts. In the first of the three, symbolized by the number seven (think Libra), we have reflective consciousness symbolized by our place within earth’s gravitational field and our upright posture. In the second division, materiality begins to disintegrate, and consciousness is challenged to regenerate and change its manifestation. In the third, there is a synthesis toward a unity of consciousness and the universe becomes saturated with information, not materiality. The Fourth Quadrant is characterized physically by extremes of temperature and density as we are in an a-temporal realm “after” the evolution of matter and consciousness and “before” the beginning of a new universe. Negre acknowledges that this quadrant is difficult to characterize but may be approached through examining the places opposite: 10, 11, 12 opposite 4, 5, and 6. Perhaps when quantum physics and general relativity are joined in a vaster vision, this Fourth Quadrant will be easier to comprehend. Negre is not attempting to prove or justify astrology using modern science – he and I agree that this is an exercise in futility. Negre’s astrological range in this book seems confined to Rudhyar and a few other basics. In the following chapter Negre discusses astrological aspects and the three crosses but mainly focuses on the oppositions between signs. Leo is analogous to the creation of heavy elements in stars, a step necessary for the complexity that we know as our cosmos. This distinguishes the single universe that is our own from other possible universes. Opposite Leo is Aquarius, a phase where “vacuum energy” (that may be partly dark energy) combines – if you want to call it that – with an gravitational attractive pull. This then takes apart the complexity of this universe, from which other possible “virtual universes” of mathematical possibilities emerge. And so on, through the remaining five oppositions of zodiacal signs. You are welcome to think that all this is more than a little strange. I found his superimposition of cosmology onto the zodiac shocking, but then I thought more about it. Negre has methodically set the stage for this superimposition in previous chapters. More importantly, if you look at traditional depictions of the signs of the zodiac, their applications range from colors to countries. Practical usefulness aside, our hundred-twenty-year-old habit of pressing the signs of the zodiac into twelve discrete personalities is no more a conceptual stretch than applying them to modern cosmology. For many astrologers the most interesting chapter will be the final one, where Negre projects a Jungian view of psyche – or the totality of our minds and mental experiences – onto the same astrological/cosmological grid. Remember that the horizontal line consists of cosmic inflation at the very beginning of the universe (corresponding to an Aries phase) and the emergence of reflective consciousness (Libra). Perpendicular to the horizontal line is the beginning of form as matter and light separates (Cancer phase). Opposite the Cancer phase is the “Big Crunch”, whereby matter comes apart and consciousness transcends physical manifestation (Capricorn). Corresponding with the Cancer phase is Ego, and Self is on the other side. As there is mirroring across these cosmological phases, Ego and Self also mirror each other. The Jungians among us are on familiar ground. The horizontal axis is more interesting, because it relates psyche to the material world. We have “matter” on one side but inseparable from psyche: he quotes Werner Heisenberg: “it is no longer nature in itself, but rather nature exposed to man’s questioning, and to this extent man here meets himself.” Here Negre cites the Jungian approach to alchemy and synchronicity; my response is: just go to an art museum or gallery. This corresponds to an Aries phase of the total psyche. 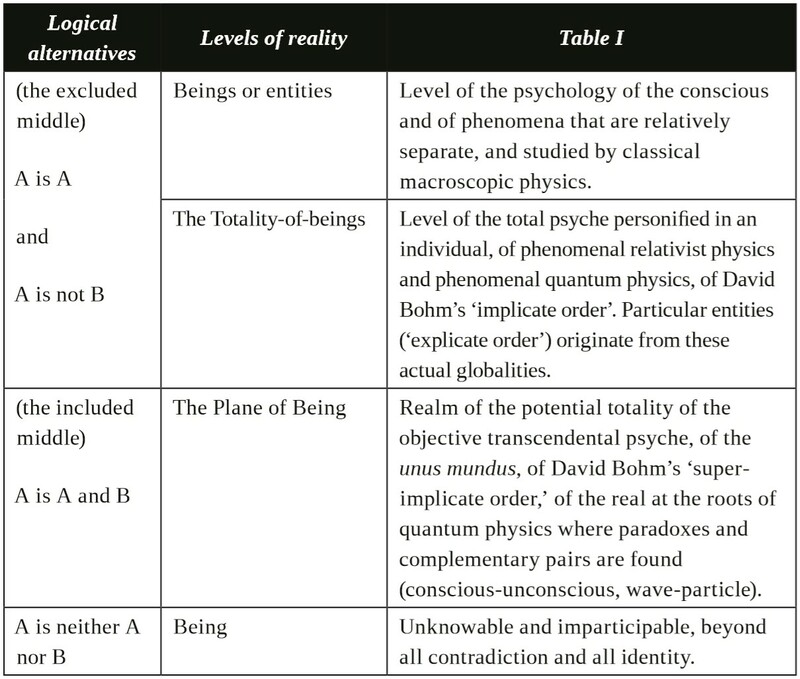 Negre uses different names for what is across from “matter” – “collective unconscious”, “psyche”, “objective psyche” from von Franz, and even from Jung, “absolute knowledge”. Negre defines this as knowledge outside our realm of ordinary consciousness and “diffused throughout the totality of existence.” He cites the newer paradigm of information (not matter) being the foundation of everything and cites the idea of lumen naturae, or light concealed within nature. Here we’re at the Libra phase, parallel with the emergence of reflective consciousness in the structure of cosmology. Arriving at this destination was worth reading the previous 180 pages. English is not Negre’s first language. He wrote this book in English, however, to reach a larger audience. (Among other things he completed his masters work in the United States.) His use of English is quite good, yet his writing lacks the flourish that might make it easier to follow. Negre’s writing style reflects the compressed nature of the material he presents, and many readers will find it dry. I don’t know if this reflects how Negre’s mind works or how his English works. Reading this book and now reviewing it, I am reminded of a famous book critic, Dorothy Parker, once writing of a novel that is was not to be tossed aside lightly: “It should be thrown with great force.” As somebody unfamiliar with much of the material Negre casually packs into The Archetype of the Number, I’ve had this desire to throw the book across the room with great force. If this happens to you, I can only encourage you to pick up the book again and keep at it. You may not agree with his premises, or his methodology, or with his depiction of astrological symbolism or modern physics and cosmology, or his cherry-picking the western philosophical tradition. But this is no reason not to take the book seriously and to read it carefully. This book is not for everybody, and my review will surely encourage some to never come near it. I encourage you, however, to take up the challenge, wrestle with the ideas contained here, and engage in productive dialogue with the author and with others. Buon viaggio!